Step 1: Peel the butternut squash and then coat it with olive oil. Sprinkle it with salt, and roast it in the oven at a temperature around 400-425°F / 200-220°C until it begins to brown. To cut thick gourds such as squash and pumpkins, use a large chef's knife and a mallet. First, slice off a thin piece of the gourd so that it lies flat and doesn't roll, then gently tap the knife blade through the gourd. Step 2: Purée the squash and the rest of the ingredients in a food processor or with an immersion blender. When you go to purée the ingredients, hold back some of the squash and some of the stock, taste the purée, and see which you think it needs. Want it thicker? Add more squash. Thinner? Add more stock. This soup by itself is very basic. Garnish with whatever else you have on hand that you think might go well, such as garlic croutons and bacon. Or top with a small dab of cream, some toasted walnuts, and dried cranberries to give it a feeling of Thanksgiving. How about a teaspoon of maple syrup, a few thin slices of beef, and some fresh oregano? Chives, sour cream, and cheddar cheese? Why not! 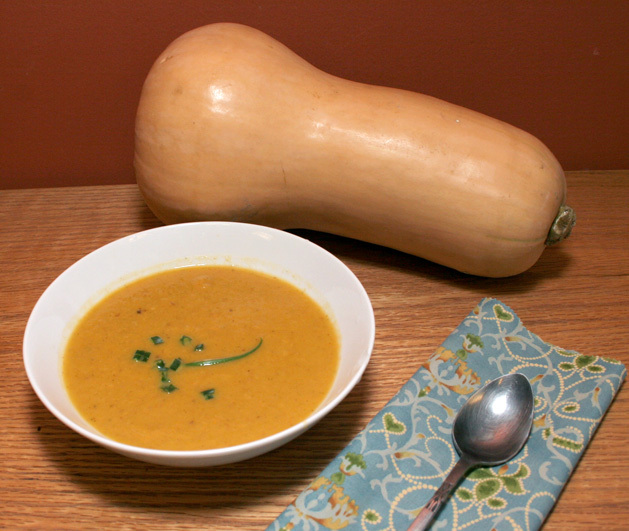 Instead of purchasing items to follow a recipe exactly, try using leftover ingredients from other meals to complement the squash soup. If you're in a rush, you can "jump-start" the squash by microwaving it first. Peel and quarter the squash, using a spoon to scoop out the seeds. Then, cube it into 1-2" / 3-5 cm pieces, drop it into a glass baking pan that's both oven and micro- wave safe, and nuke it for four to five minutes to partially heat the mass. Remove from microwave, coat the squash with olive oil and a light sprinkling of salt, and roast it in a preheated oven until done, about 20 to 30 minutes. If you're not in a rush, you can skip the peeling step entirely: cut the squash in half, scoop out the seeds, add oil and salt, roast it for about an hour (until the flesh is soft), and use a spoon to scoop it out. Peeling raw pumpkins is much too much like hard work. I roast with the rind on and incorporate it. Tastes yummy after roasting. I also often add a bit of curry powder to pumpkin soup - not enough to make it hot, but just enough to perk up the flavour - rather like adding nutmeg or mustard powder to a bechamel. I have no success with butternuts here, so am cooking really thick rinded pumpkins which are just too tough to add to the soup. will try the curry idea Billy, next time I do some. I'm waiting until next year, and hope that my butternuts actually germinate!